I have a bit of a head block when it comes to leopard print footwear. It always feels a bit 'out there' and that aule cow Bet Lynch is partly to blame. I think for me, she made 'full on' leopard print middle aged & desperate and I cringe when people use terms to describe leopard that include her name! No, I am not wearing a 'bit of Bet' today...because that just makes me feel like I've 'TRAGIC' tattooed across my forehead. Don't get me wrong, I do like leopard accessories...scarves, glasses, belts. It's footwear, and specifically the wearing of leopard footwear in daylight hours that up until now, I always declared never for me. 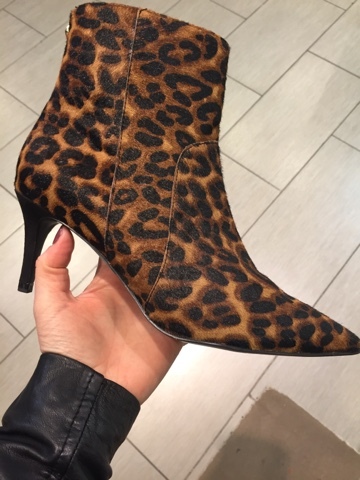 But we're on a theme here of being brave - so meet my new leopard print boots. I got them at an event Next organised in Belfast last week. 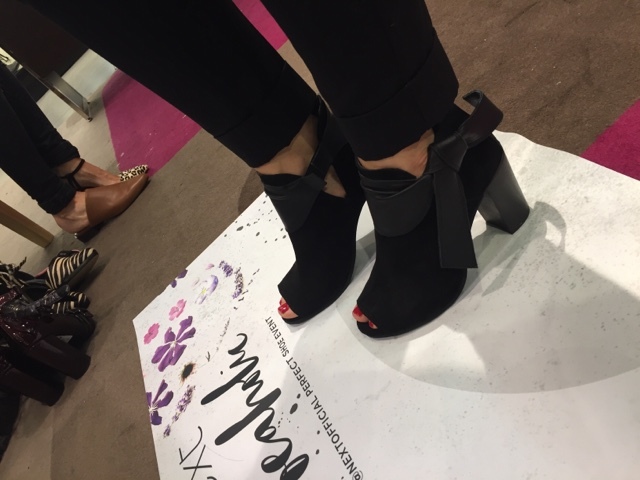 Next are one of the few big brands that make an effort to come over to Belfast regularly with their UK-based team and meet bloggers and when they contacted me to say that the event they were organising was a shoe event...well I was ALL over it. 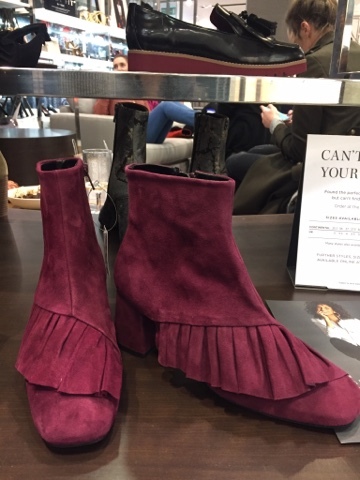 Held in their Donegal Place flagship store, we were treated to pedicures and sweet treats and offered the opportunity to try on as many pairs of shoes as we wanted and bring a pair home. I passed on the pedi and food and went straight for the trying on. Priorities. 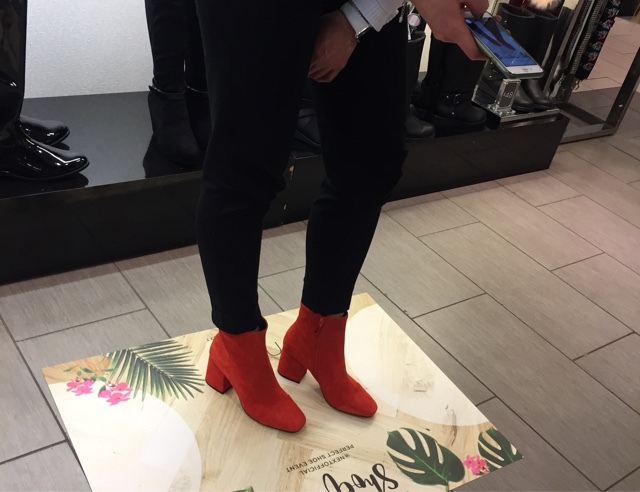 These orange/red boots have been all over the press and are rather fabulous (as modelled by Rosanna). 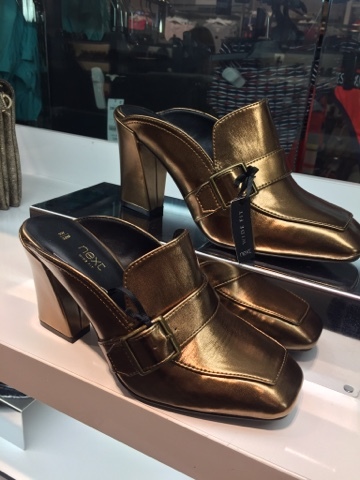 You're not allowed to call yourself a fashion blogger unless you have a pair of metallic loafer style shoes at the moment.. I was strongly drawn throughout to the leopard. But I kept talking myself out of them and instead tried on EVERYTHING else. But 1.5 hours and a lot of enabling later (Jess & Rosanna, I'm looking at you! ), I went back and got the boots. Size down by the way.....they're generous. Then in much the same way as you'd face your fears with anything else, the next day I wore these full-on fabulous boots in daylight in Belfast for the whole day. I walked around Holywood, trudged up and down the Cregagh Road, parked a mile away from a coffee shop on the Ormeau Road and did the school run twice. All in these boots. Do you know what? They are SO comfortable....I was able to stride out in them and they didn't pinch or rub anywhere. 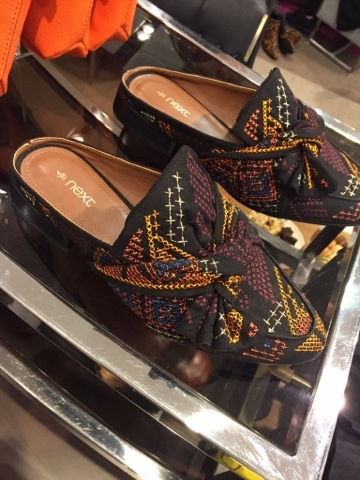 The heel height is perfect - small enough for day to day but high enough that I know they would work really well at night too. Jess has made me promise to wear them with black cigarette pants, a black cashmere jumper and a leather jacket. She's a good enbaler. 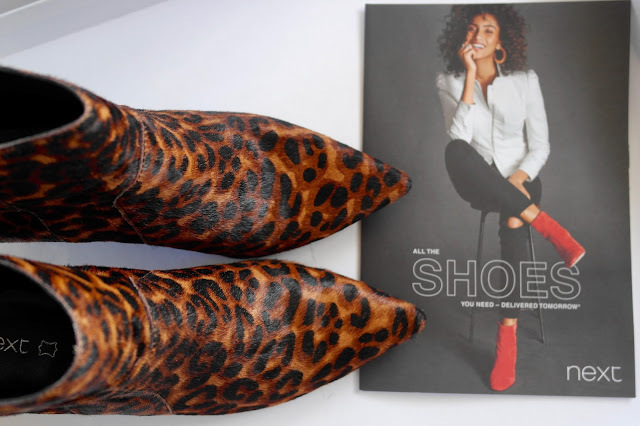 I'm not entirely there yet...these things take time but I'm half way to overcoming my leopard footwear fears and I'm now associating them with being fierce and fabulous (thanks for that one Michelle!). Watch this space. Rather appropriately, this is what I wore to the Next event. 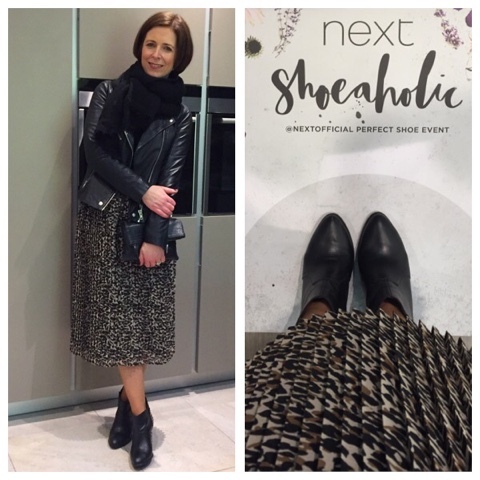 I dug out the M&S leopard print midi skirt that I promised I'd wear on my being brave post from the other week. I got laughed out of the house...the husband and son really don't get midi skirts at all. I wonder if now fierce I felt that night had something to do with the boots being chosen?! 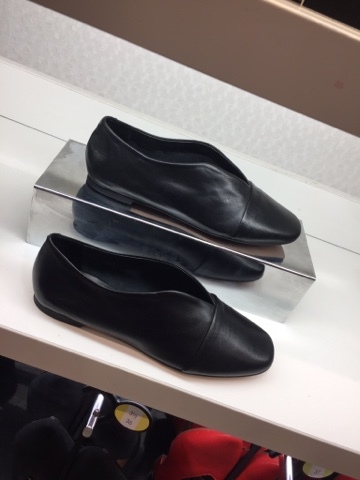 Love those metallic loafers but the ballet pumps look like gout slippers to me! The leopard print boots look amazing. They're fabulous! 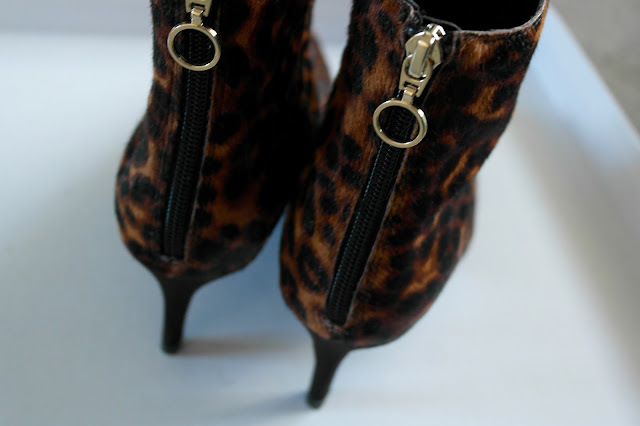 I still hanker after a pair of leopard shoe boots I passed over years ago, good for you! Love the boots. I have a pair which are similar and also had reservations about wearing them. I quite often wear mine to the office under chocolate brown trousers with the lapels and cuffs of my leopard print shirt peeping out under a caramel brown jumper. It's now my most complimented outfit! Be brave!!! 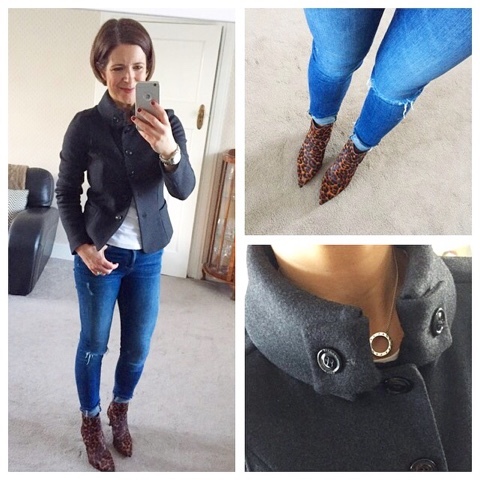 I do like leopard print, for me it's practically a neutral! I've got two scarves, ballet flats and a small pouch which I love. The only thing I couldn't get on with was the leopard print h&m jumper, that was a bit too much leopard for me!